80L bin complete with lid. H 70cm x dia. 54cm. This 80L bin comes complete with a removable lid which minimises the transference of smells making is suitable for both inside and outside. It has a black glossy plastic finish so it is suitable for most weather conditions - it’s also waterproof and easy to wipe clean. It’s made from plastic and therefore is easily recycled. 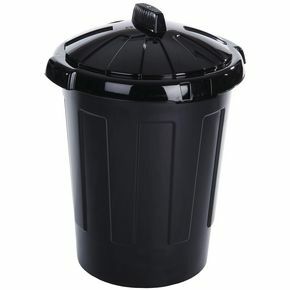 With a large capacity, a diameter of 540mm and a height of 700mm this dustbin can hold a large load and thanks to its material it is able to hold a variety of items. This bin also comes with a 12month guarantee for your own peace of mind.